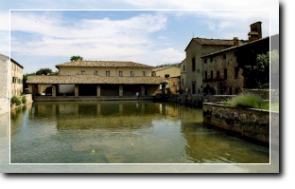 Bagno Vignoni is the renowned Tuscan spa centre. In the middle of the village is the wonderful thermal pool, 49metres x 29 metres, famous for its sulphurous hot water springs (52°) since Roman times. Many illustrious personalities have benefited from these waters, such as Santa Caterina from Siena e Lorenzo the Magnificent and they have also been part of many famous films.